The first details on the PS5 have just landed, and it has brought with it a confirmation that your current PlayStation VR headset will work with the next-gen console. Speaking to Wired, Mark Cerny (lead system architect at Sony working on the upcoming console) confirmed that all existing versions of the PlayStation VR will be compatible with the next-gen console. 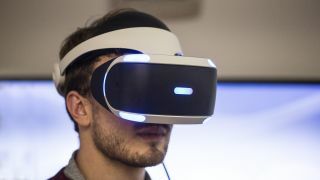 Whether there will be a new PlayStation VR 2 at launch is currently unclear. Cerny said, “I won't go into the details of our VR strategy today." While he didn't say that Sony won't be updating its virtual reality headset at the launch of the next-gen console, he was swift to clarify that it's worth buying an existing PSVR if you haven't already got one. Games for the PlayStation 4 are set to be backwards compatible with the PlayStation 5 too, so we can expect that you'll be able to switch your existing PSVR catalogue over to the next console. Other details revealed about the latest PlayStation console include 8K support, an internal SSD, as well as the news that the console won't be coming out this year. Cerny didn't reveal when we'll actually see the Sony PS5, but the company has begun seeding devkits to developers, so it's likely we'll hear more about it in the next year or so.